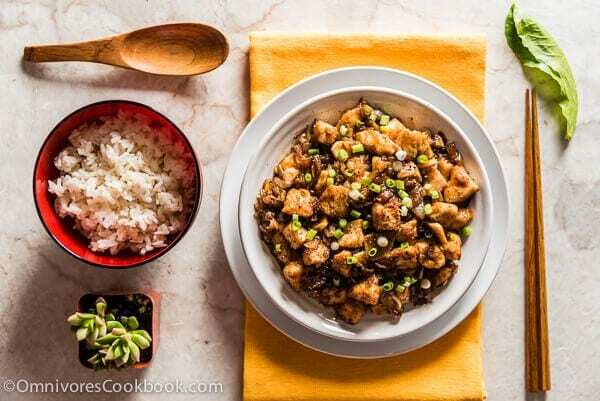 This stir fried chicken dish uses a simple and rich black bean sauce with tons of herbs to bring out the best flavor of the chicken. 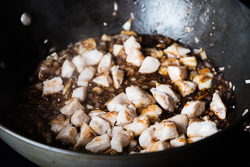 Today I want to introduce a super simple chicken stir fry recipe with a delicious sauce – black bean sauce. If you’re wondering where the veggies and greens are, let me make a quick introduction. Unlike most takeout Chinese in the US, authentic Chinese stir fry recipes usually emphasize one ingredient and keep the dish really simple. 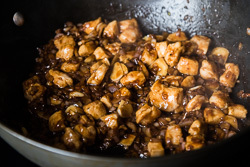 For example, if it’s a chicken stir fry dish, 80% of the dish will be chicken, and the remaining 20% of the ingredients will be seasoning and spices (unless it’s a Szechuan stir fried chicken, in which case the dish might contain 50% chicken and 50% dried chili peppers). If a dish emphasizes vegetables, it might add a bit of meat (pork belly is commonly used), but only use its flavor to enhance the whole dish. If you visit China, you’d be surprised that you are not able to find “beef with broccoli” in any restaurant. We don’t serve a stir fried dish that’s anything like that. The recipe I’m introducing today is a good example. You might be surprised at the generous amount of herbs used in this dish, on a single piece of chicken breast. Try it once, and you’ll love the results you get. 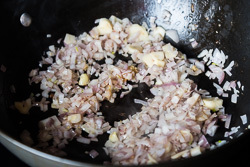 Although the sauce is already really rich and delicious by itself, adding tons of shallot, ginger, and garlic will largely enhance the intensity of the umami. This is the key to recreating the true flavor of China, even without a wok. Speaking of the sauce, I’m in love with the LKK black bean sauce lately. If you’re tired of using soy sauce to cook noodles and other dishes, give this sauce a try. The sauce uses fermented black beans to create a distinct savory flavor that goes great with black pepper. It’s a popular sauce and is usually used in Cantonese recipes to cook meat and seafood. It’s a great sauce for stir frying and steaming. In the end, if you really want to add some veggies to this dish, make sure you cook the veggies separately and use those with low moisture. If you’re adding blanched broccoli or asparagus, make sure to drain the water thoroughly. The sauce in this recipe was thick enough, so I didn’t add cornstarch to it and dilute it. Prepare a potato starch slurry (1 teaspoon potato starch + 1 tablespoon water) before cooking. If the sauce doesn’t thicken once you’ve finished stir frying, swirl in the slurry to thicken sauce. I hope you enjoy this quick and easy stir fried chicken! Do you like my recipes? Sign up for Omnivore’s Cookbook’s weekly newsletter to get the latest updates delivered to your inbox and a free e-cookbook! And stay connected via Facebook, Instagram, Pinterest and Google+. Thanks for reading and happy cooking! Combine chicken breast, Japanese sake, potato starch, and salt in a bowl. Mix well and set aside. Combine all the ingredients for the sauce in a small bowl. Chop and prepare veggies and herbs. Heat 1 tablespoon oil in a large nonstick skillet over medium high heat until hot. 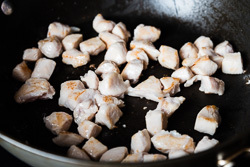 Spread chicken in the skillet without overlapping. Let cook for 30 seconds without stirring. Separate the chicken with a spatula (it might stick together due to the potato starch). Cook until the bottom side turns slightly golden. Flip and stir chicken to cook other sides, until the surface is cooked but the inside is still a bit pink. Immediately transfer to a plate. Add the remaining 1 tablespoon oil to the skillet and turn to medium heat. Add ginger, garlic and shallots. Cook until shallots begin to turn soft, 30 seconds. Add sauce. Give it a quick stir. Add chicken back into the skillet. Stir and cook until the sauce thickens, 1 minute. Immediately transfer everything to a plate. Serve warm over steamed rice. Hi David, I don’t know any gluten free black bean sauce, but I think it’s possible to make them at home. 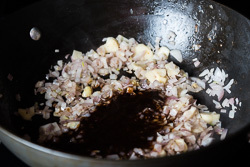 The main ingredients of black bean sauce include fermented black bean (gluten free) and soy sauce (not gluten free). If you replace soy sauce with tamari, then the sauce will be gluten free. I’ll look into this and try to figure out the recipe. And I’m so glad you found Shaoxing wine! I think it has a few name (with similar pronunciations) and it’s quite confusing. It’s great that you managed to locate it 🙂 Happy cooking and have a great week ahead! I became addicted to your blog after the meat pie recipe, which btw is almost identical to the Nigerian meat pie… I love your review and your photos. You’ve inspired me to step out of my comfort zone and try something new (something like this). Sake might be hard to find in Nigeria though (which is where I am currently)… Would you know of any replacements? Hi Chichi, it’s very interesting to know that Nigerian meat pie is similar to the Chinese one! I’d love to try it out! If you cannot find sake (or Shaoxing wine), you can try other hard liquor such as vodka. In this recipe, use 1 teaspoon vodka as an alternative to 1 tablespoon sake. Sake adds a subtle umani flavor that is slightly sweet, while vodka might be edgy and tastes different, but the dish should turn out great. I tried using vodka to make teriyaki sauce and it was tasty. If you don’t like the idea, you can skip sake and replace with water instead. I won’t suggest you to use white wine in this recipe, it’s too fruity. I read through your description and instructions and can’t wait to try it. I think I already have everything too. I really like the way you explain every step as I’m not great with making sauces. Thank you! Hi Sherry, thanks for taking time and leaving a comment! I’m so glad to hear you like the recipe and found the information helpful. Making the right amount of sauce and thicken it without overcooking the ingredients can be tricky. I always find preparing a small bowl of potato starch slurry (or other types of starch) while cooking can be helpful. It thickens the sauce within a few seconds. I’m so glad you tried out the recipe and liked it Sherry! 🙂 Yep, all the herbs and the sauce will make your room smell so delicious. The stir fried gai lan sounds great. I can only get it at Asian market so we don’t have it so often. Will definitely grab some to cook next week. Is it possible to substitute something else for the potato starch? I’d like to cook this for a family member who has Nightshade allergies. Hi David, I’m not very familiar with Nightshade allergies. Can you use cornstarch or tapioca starch? 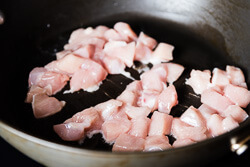 We use the starch to coat the meat before stir fry, so they can stay tender without being over cooked. If you cannot use any of the starch, try use boneless thigh without coating with starch. The thighs are not like chicken breast. They can still stay tender even without the starch coating. Looks really good! I love making this kind of dinner at home! One of my favorite dishes. Love black bean sauce. So tasty! 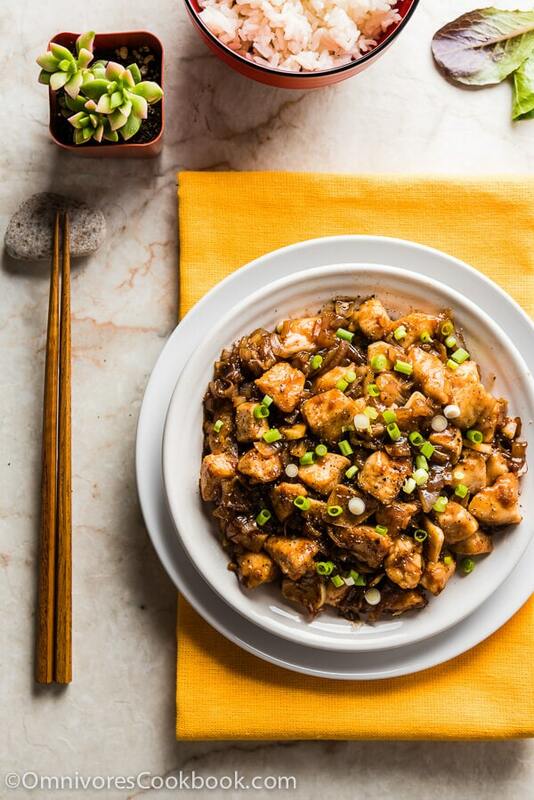 Hi Maggie, your recipe for Chicken with Black Bean Sauce hit the spot! 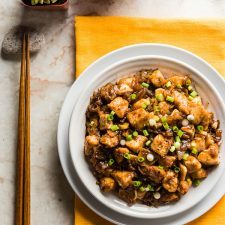 I’m Chinese-American, and I’ve been on a quest to find the perfect version–with a good balance of salty, savory and a touch of sweet. Your recipe rocks! 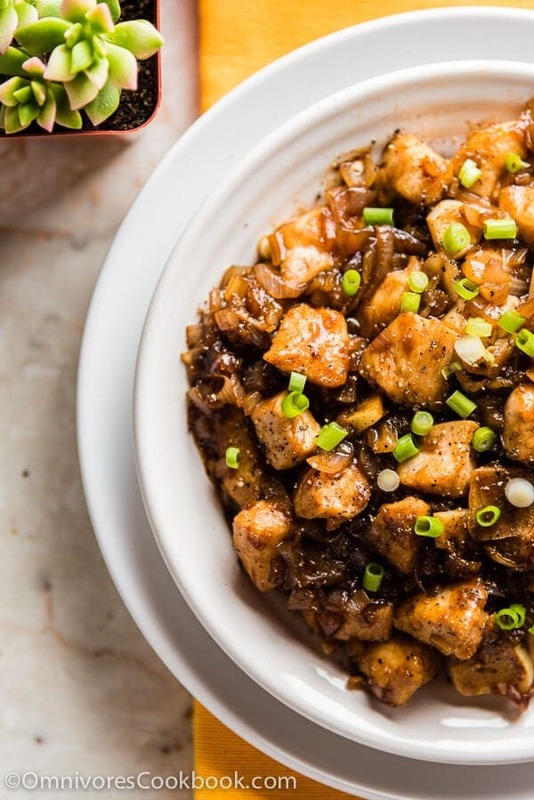 I substituted a few ingredients: 2 tablespoons of fermented black beans (instead of black bean sauce), added 1/2 an onion (thinly sliced), 1 bell pepper (chopped) and lots of garlic (I didn’t have ginger or shallots), cornstarch (instead of potato flour) and Shaoxing wine (instead of sake). It was soooo good! Thank you for sharing your recipe, and I look forward to exploring and trying out your other recipes! I’m so glad to hear the recipe works for you Angela! Yes, it’s totally OK to replace the black bean sauce with fermented black beans. And adding bell pepper sounds so delicious too! It is a bit too salty for my liking. Maybe I will add an extra tablespoon of water or cut back on the ratio of the other sauces. Nevertheless, this is definitely a delicious meal worth repeating! Hi Chin, next time you could try use a pinch of salt to marinate the chicken instead of 1/4 teaspoon. It should help. This was great! Used corn starch and dry sherry substitutions and cut an onion in large dice. Had your black bean sauce in the refrigerator. Not much prep which is a big plus for me. Can i just say how much I love your blog and your posts! I stumbled upon this recipe and thought hmm lets give it a go. Boy Im glad I did coz this dish was AMAZING !!!!! SO FREAKING GOOD. I served it with brown rice, my baked tofu and garlic-ginger broccoli. I’m now going through your recipe list deciding what to cook next! Love the taste, love the ease and how quickly this comes together. I added some barely steamed bok choy and will make this more often now that I have tried it. Thank you for your great recipes and the way you write about food. I always look forward to your new posts and recipes. Keep up the fantastic work you do educating us on Asian foods. Hi Marijke, thank you for the kind words! I will pass them along to Maggie. As Maggie’s husband, I’m constantly learning new things about Asian foods, as well, and I love it when she introduces me to dishes like this, which was new to me and I used to live in China! If I don’t have oyster sauce what can I use? Also I want to use mince chicken will I have to reduce the cooking time ( for the same amount of grams)? Hi Jade, I would replace it with 1/2 tablespoon soy sauce plus 1/2 teaspoon sugar. Re cooking time – I won’t worry too much since minced chicken won’t turn super tough even if you overcook it for a bit. I recommend observe it while cooking. The chicken will taste juicy if you stop cooking as soon as it’s cooked through. Don’t use sake. Sake is Japanese, not Chinese! Use Shao Xing.